If you are looking for something to make a statement to your guests, why not consider our stunning black starlit dance floor? Consisting of seamless, interlocking panels, our black floors are fitted with bright white LEDs which sparkle and glow through the rich gloss black finish, creating an attention-grabbing night sky effect to astound your guests. This floor is the perfect addition to both weddings looking for a twist on the more common white starlit floor, as well as corporate and private parties. Whether you require the white LED lights to remain all on static, or flash and twinkle, the dance floor lighting can be fully controlled to change the intensity and flash speed, as well as even make the floor sparkle to the tempo of a first dance. In the flesh, in photos, and in videos, our black starlight dance floors look truly magical! 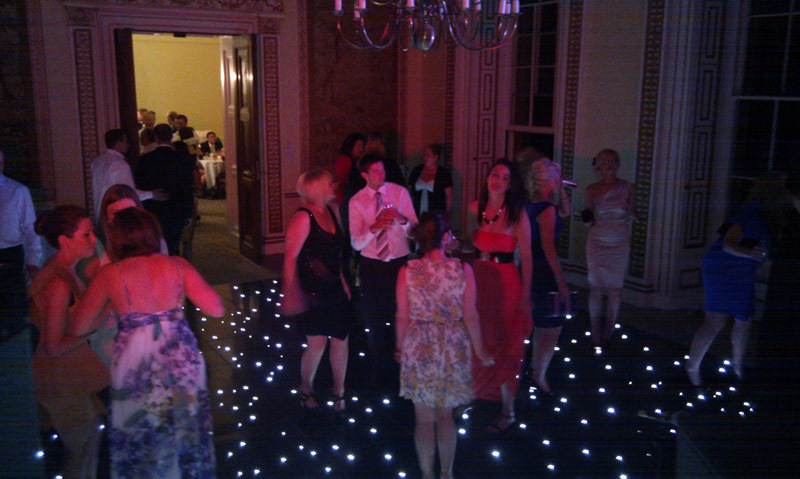 Our black starlit dance floors can really compliment and add that finishing touch that is often overlooked. The black starlight dance floor can be controlled by a wireless monitor that can keep the lights static of flash even keeping them to the best of the music! We recommend for weddings to turn the lights on as you make your way on to the dance floor for the first dance and match the beat of your first song to set a great atmosphere not to mention look amazing in the photos. The dance floors we supply simply slot and lock into place and will be installed and dismantled by our professionally trained team who will prep and make sure your dance floor is in pristine condition! All you need to do is dance and enjoy yourselves. This stunning dance floor will no doubt be a huge focal and talking point at your special event or wedding. We promise that you will be dazzled by the dance floor you choose whether it is square or rectangle, small or large you can be sure it will be something you will remember. Our corporate black dance floor has been extremely popular on many corporate and high-end Events. This particular dance floor is a new addition to our stock and we are experiencing high levels of demand throughout the corporate industry. The strong, robust design of the all black dance floors ensures a safe area to where your guest can dance the night away safely and with style. The highly polished shiny Black Dance Floor can be installed to any dimension desired and will most certainly create that ‘WOW’ factor. The Black Dance Floor Comes in 4ft x 2ft sections and can make almost any size dance floor you require. For safety reasons we use a metal sloped trim around the perimeter of the flooring which finishes the floor of lovely. We are now able to offer the black dance floor in the starlit range. The floor is plain black and has lots of little L.E.D lights which twinkle at various speeds.